This article is about Mii Fighter's appearance in Super Smash Bros. Ultimate. For the character in other contexts, see Mii. Mii Fighter (Miiファイター, Mii Fighters) are playable characters in Super Smash Bros. Ultimate. They were confirmed as playable characters on June 12th, 2018 with their Brawler, Swordfighter, and Gunner variants returning. Masahiro Sakurai stated in their introduction that Mii Fighters are planned for inclusion in online battles; this stayed true at the game's release, as fully customizable Mii Fighters are now usable in online play against strangers in Quickplay. Previously, their use online was restricted to playing with friends in Smash 4. The Brawler, Swordfighter and Gunner are classified as fighters #51, #52, and #53 respectively. 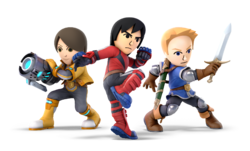 The Mii Fighters have twelve different voice options, each provided by a different voice actor: Yuji Kishi (Voice 1), Umeka Shoji (Voice 2 & 12), Takashi Ohara (Voice 3), Ayumi Fujimura (Voice 4), Ryotaro Okiayu (Voice 5), Makiko Ōmoto (Voice 6), Minami Takayama (Voice 7), Michihiko Hagi (Voice 8), Hideo Ishikawa (Voice 9), Kimiko Saito (Voice 10), and Kiyoyuki Yanada (Voice 11). There is also an option for them to be silent, as they were in Smash 4. The list below covers the general changes of the Mii Fighters as a whole. For information about each Mii Fighter's moveset changes, see Mii Brawler (SSBU), Mii Swordfighter (SSBU), and Mii Gunner (SSBU). The Mii Fighters were formerly considered some of the most volatile and situational characters in SSB4, due to their heavy reliance on customization to compensate for their lacking default movesets, which also made them infamous for their legality in tournaments. Likely as a result of these factors, the Mii Fighters have been given significant changes in the transition to Ultimate. One of the biggest changes involve them now having fixed attributes for each type of Mii Fighter, which streamlines their previously height and weight-dependent stats: the Mii Brawler is now the lightest and fastest, the Mii Gunner is the slowest and heaviest, and the Mii Swordfighter is the middle ground of the two. In addition, their standard attacks have been made more reliable through a reduction of lag, and the majority of their extensive special moves have been heavily modified to have enhanced speed, combo potential or power, or even replaced by completely new attacks. Most notably, the Mii Fighters' default special moves have been given a variety of buffs to make their KO or combo potential surprisingly high, meaning that they can now function equally as well with only their default moveset; this also eliminates their previous weakness of situational default moves with low KO potential. However, the Mii Fighters have also been nerfed indirectly. Their new fixed attributes give each of them a new specific weakness; for example, the Mii Brawler is now a fast-falling lightweight that is easy to both combo and KO, the Mii Swordfighter's average stats give it no advantage apart from air speed, and the Mii Gunner now lacks in mobility. Additionally, they retain noteworthy weaknesses from Smash 4, such as the Mii Swordfighter having mediocre disjointed range for a swordsman, the Mii Brawler still having a short reach, and the Mii Gunner having very slow mobility and attacks with high ending lag. Overall, the Mii Fighters now fare significantly better and have been repurposed to perform more consistently with or without customization, especially when compared to their SSB4 iteration with default custom moves. Whether these changes will make them tournament legal, with or without custom movesets, remains to be seen. As with all veterans returning from SSB4, the Mii Fighters' models feature more subdued color schemes. Players can now customize the Mii Fighters' voice clips. 12 voices are selectable, 6 male and 6 female, and there are also three pitch options for each voice. The Mii Fighters' costume colors are no longer dependent on the Miis' favorite colors, and can now be customized. All three types of Mii Fighter have had their body proportions adjusted. While still based off Guest Miis, the default Mii Fighters have an altered appearance. Thanks to the Nintendo Switch's expanded Mii creation software, the Mii Fighters now have more customizable facial features. The Mii Brawler's default outfit features a stylized character-colored shirt with extra padding on their forearms and shins. The Mii Swordfighter's default outfit is now a character-colored tunic with additional armor pieces, along with a sheath on their back. The Mii Gunner's default outfit is now a bodysuit with a character-colored jacket and boots. The Mii Fighters' height and weight can no longer be customized. This makes them easier to learn, but removes the ability to optimize their size and weight for different playstyles. Each type of Mii Fighter has a different preset weight value, with Mii Gunners being the heaviest and Mii Brawlers being the lightest. In addition to the removal of height and weight-dependent attributes, each Mii Fighter's stats are now fixed: this includes walking speed, dashing speed, falling speed, fast fall speed, air speed, and damage output/knockback. On the character selection screen, all three classes of Mii Fighter are listed separately instead of sharing a slot. However, this is not the case if the character selection screen is set to stacked mode. As a result, the announcer now says "Mii Brawler", "Mii Swordfighter", and "Mii Gunner" instead of simply "Mii" for all three classes. The Mii Fighter's victory theme is now a remix of Ultimate's theme song, Lifelight. All three Mii Fighter types' versus portraits have their faces blocked out. Miis can now be used in local wireless play and online play (even Quickplay against strangers), and can be fully customized, moveset-wise and aesthetically. Presumably to prevent abuse of the name system, Mii Fighter's custom names will not be displayed in Quickplay. Instead, "Mii BRAWLER", "Mii SWORDFIGHTER", or "Mii GUNNER" will be displayed as their name. The Mii Fighters are no longer playable in Classic Mode, though they still appear as opponents for different characters. The default Mii Fighters taunting on Battlefield. The default Mii Swordfighter striking Villager with his dash attack on Hyrule Castle. The default Mii Gunner striking Luigi with her jab on Wrecking Crew. The default Mii Fighters dashing after Pikmin on Find Mii. The default Mii Brawler striking Kirby mid-Stone with his Head-On Assault on Skyworld. The default Mii Fighters shielding on Mario Circuit. Although the Mii Fighters technically represent the Super Smash Bros. universe in both Smash 4 and Ultimate, the stage shown on their character page background is Find Mii, a stage based on a Mii-represented game. Additionally, in the "display by series" organization on the site, the Mii Fighters use the Mii Channel logo instead of the Smash Bros. logo. Despite being fighters #51, #52, and #53 respectively, they are not placed between Greninja and Palutena in the character selection screen but at the end just before the Random option. The Mii Fighters are the only characters in Ultimate to have custom moves. The Mii fighters' names, outfits and custom specials moves can be changed and customized. Custom equipment has been replaced with custom voices. If they are counted as starter characters, (due to them not having a Challenger Approaching fight) they are the only starter characters other than the starter characters from Smash 64. Defeating the Mii Fighters in World of Light automatically adds the default Mii that was just defeated under the name "Mii" (with a default 1111 moveset) to the list of Mii Fighters, for all modes where Mii Fighters are usable. These characters can be deleted, just like any other Miis. However, there is no way to regain them if the player does so. The Mii Fighters are the only characters in Ultimate to not be usable in Classic Mode. They are also not usable in the new Smashdown mode. In languages with gender-specific names, the voice clip from the announcer on the victory screen is slightly different from the one used on the character select screen, instead featuring a noticeable translation of "the". They share this trait with Wii Fit Trainer, Inkling, Pokémon Trainer, and Villager. The Mii Fighters have a stock icon that universally represents the three classes in Ultimate's website that was seen in demos of the game. This icon doesn't appears in the proper game, instead each class having one of their own. This was also the case with their appearance in Super Smash Bros. 4, where an unused head icon for the Mii Fighters was seen in E3 2014, but goes unused in the final game. The Mii Fighters are the only characters that can obtain a series bonus from two series for Spirits, those being the Mii series and the Super Smash Bros. series. This page was last edited on April 21, 2019, at 21:54.